While there have been hairless cats throughout history, the most common type of hairless cat is the Spynx or the Canadian Hairless. This cat got its name because the Spynx was discovered in 1967 in Canada. The mother had fur, but her babies were hairless. 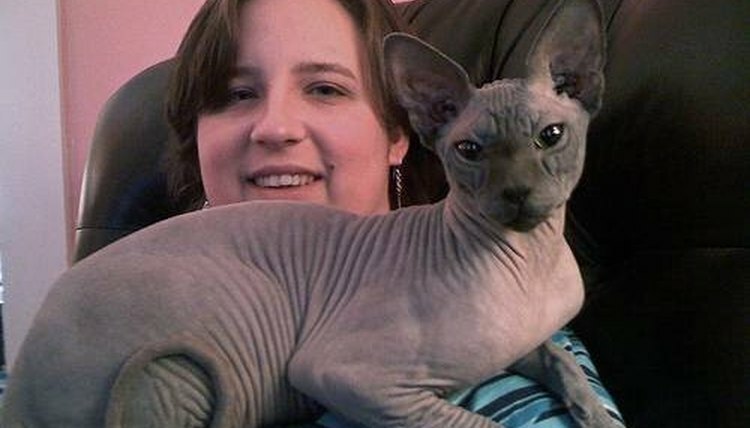 The first hairless kittens from this long-haired cat were neutered, but she had other hairless kittens, two of which were sent to Europe and bred with Devon Rex cats. The current Spynxs are descendants of two lines, Dermis and Epidermis from Minnesota, and Punkie and Paloma from Toronto, Canada. Hairless cats are becoming more popular because of their intelligence and affection, as well as the fact that, at least for some people, they are hypoallergenic. Find reputable breeders in your area. While you can purchase Spynxs in pet stores, they are overpriced and may have health problems. You will get a better price and a healthier cat if you purchase it through a reputable breeder. Visit each breeder in your area and interview them. Also, while you are there, look at their Spynxs and make sure they appear healthy and well cared for. Sit down with paper and pen and write out the pros and cons for each breeder. Decide which one you wish to purchase your Spynx or hairless cat from. Contact the breeder and set up another appointment to go back and look at hairless cats that he has available. Choose the hairless cat you want, purchase it and take it home. Consider adopting a hairless cat from a hairless-cat rescue rather than purchasing one from a breeder. Allow your hairless cat to cuddle with you under the covers, or provide him with a nice soft bed with his own covers. Because they don't have fur, they can become chilled easily. Hairless cats are expensive and can cost anywhere from $1200 to $3000 a piece. Hairless cats can get sunburned. Hairless cats sometimes are not hairless but have a peach fuzz covering their bodies. Not all hairless cats are hypoallergenic since they can still shed skin flakes that cause allergies. This is something to consider if this is the reason you are purchasing a hairless cat. Oils are distributed on a hairless cat's skin and can build up, making for a cat with greasy skin if he is not bathed regularly.